ATA's rope access technicians can accomplish in hours, work that previously took days to complete using; scaffolding, cherry pickers, knuckle booms or scissor lifts! Additionally, unlike scaffolding or powered access methods, with rope access we can operate safely without the need for level ground or open area work sites. This makes rope access an extremely efficient and cost effective option for work at heights. In addition to these listed items, other remedial, maintenance or cleaning work is available. Please call or submit an online inquiry to see how ATA can assist with your height access task. 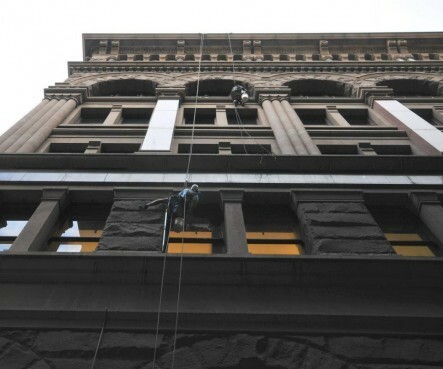 All Trades Abseiling’s systems are quick, efficient and highly successful, and the quality of our work is never compromised. We welcome inspections from our clients during and on completion of any job and we are willing to set up demonstrations to show how your building will be restored or repaired. Additionally, we keep up to date with all the latest rope access technology as well as construction products and systems, with the benefits flowing automatically to you. Customer satisfaction and good service is the personality of our business. At ATA, we realize how important you as the client are to our business. We are happy to spend time with you to consult on your building needs. Quotes are generally free of charge and of course free of obligation. We enjoy what we do and that is reflected in our attitude and the end results, with the majority of our work being repeat business. "The site was left in perfect order, a far cry from the alternative of scaffolding, which would've been expensive, noisy and intrusive."